It might be an expensive and touristy affair, but on a cold December evening, Montreux’s Christmas market is a joy to wander around. It’s a cluster of brightly decorated miniature chalets on the waterfront, where visitors can peruse the stalls for seasonal ornaments, artwork, and souvenirs; hand-blown glassware, artisanal soaps, candies and cubes of fudge; and perhaps most importantly, vin chaud – mulled wine of both the red and white varieties. The smell of foie gras sizzling on a griddle wafts into my nose as I stop to savor the warmth radiating from several open, wood-burning fires. Inside the soaring wrought-iron market hall, I browse shelves stocked with homemade jams and confections, and consider ordering what appears to be a Swiss version of mac ‘n cheese. 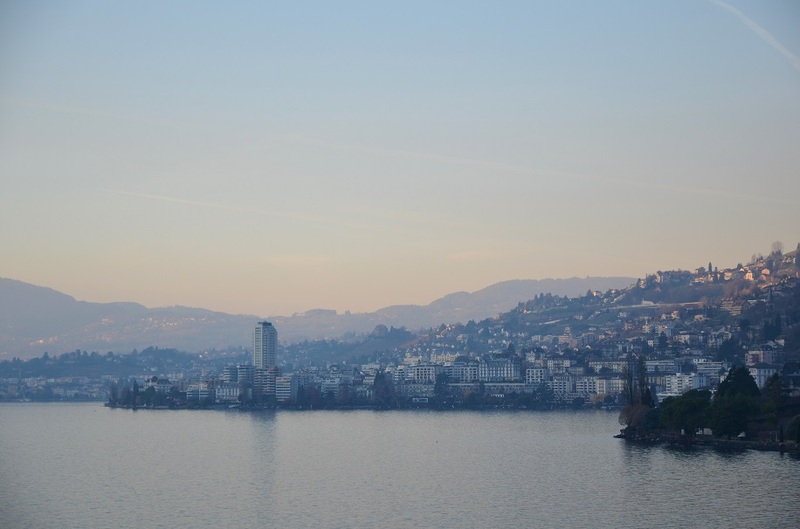 Montreux is perched on an idyllic stretch of Lake Geneva shoreline that’s known as the Swiss Riviera, and long the haunt of big-name celebrities: Charlie Chaplin, Freddie Mercury, Shania Twain. Part of its enduring appeal is the mild microclimate, dictated by a quirk of geography. 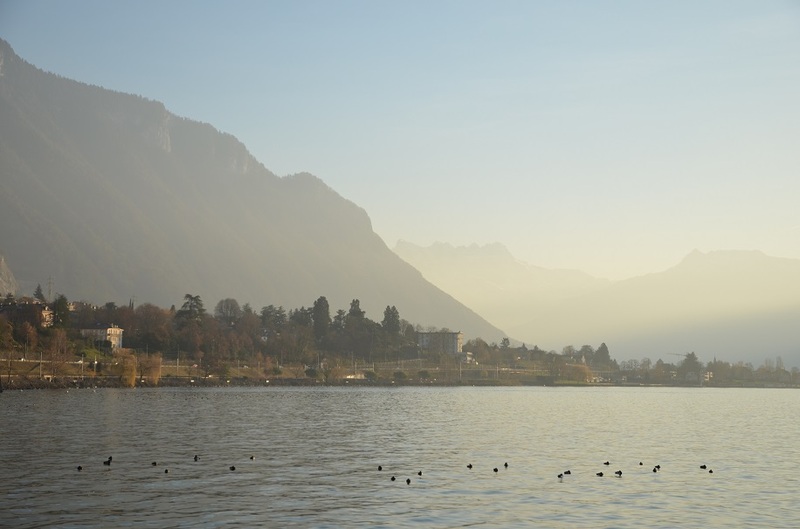 The mountains that rise steeply above Montreux shelter it from the cold, dry northeasterly wind the Swiss-French call La Bise, allowing cypresses and palm trees to flourish on the lakefront. 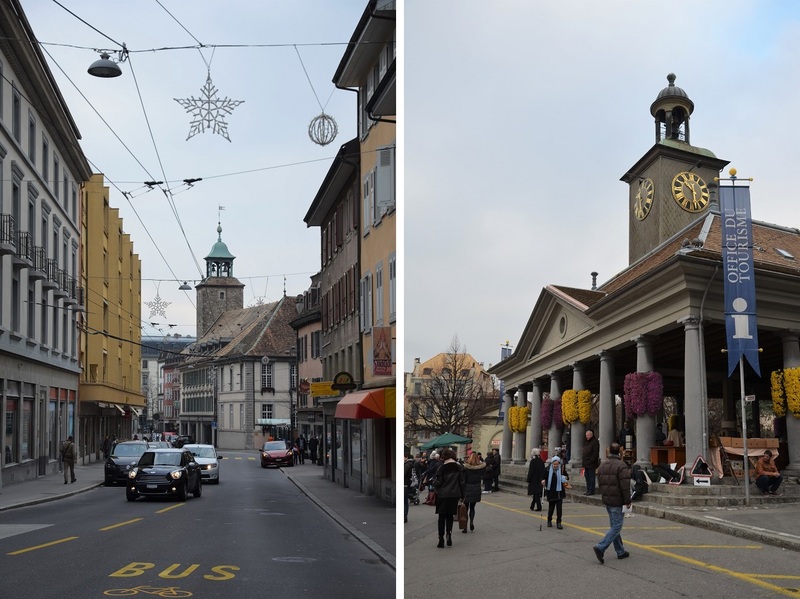 But in a country with no shortage of picturesque towns and cities – like the capital Bern, whose historic center is a UNESCO World Heritage Site – the town of roughly 27,000 doesn’t seem particularly attractive at first glance. A high-rise apartment block stands out like a sore thumb amid the 19th-century buildings that descend in terraces to the lake, and the uninspired modern casino is a far cry from its stately predecessor, which burned down in 1971 during a Frank Zappa concert. 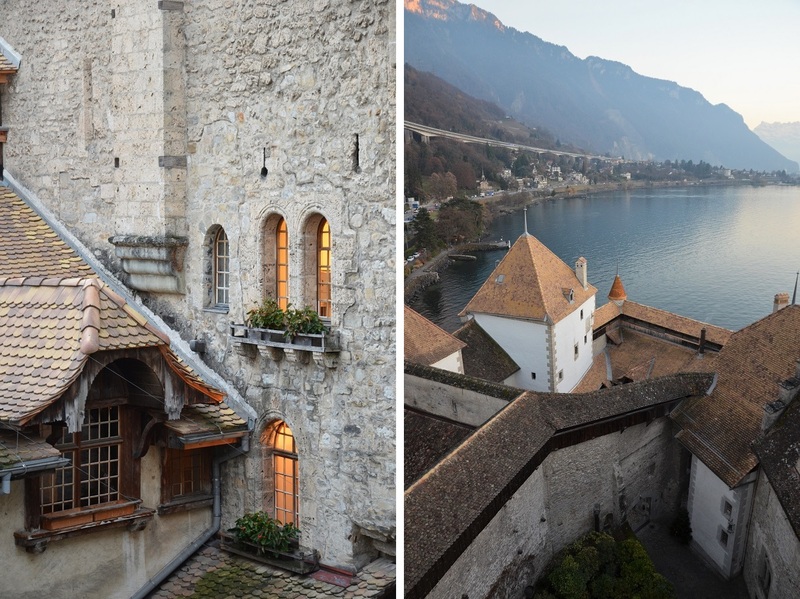 The biggest draws here are Montreux’s famous summertime jazz festival and the nearby Château de Chillon, a storybook castle dating from 1160 that takes up a small island, strategically located near the entrance to the Rhône river’s Alpine valley. 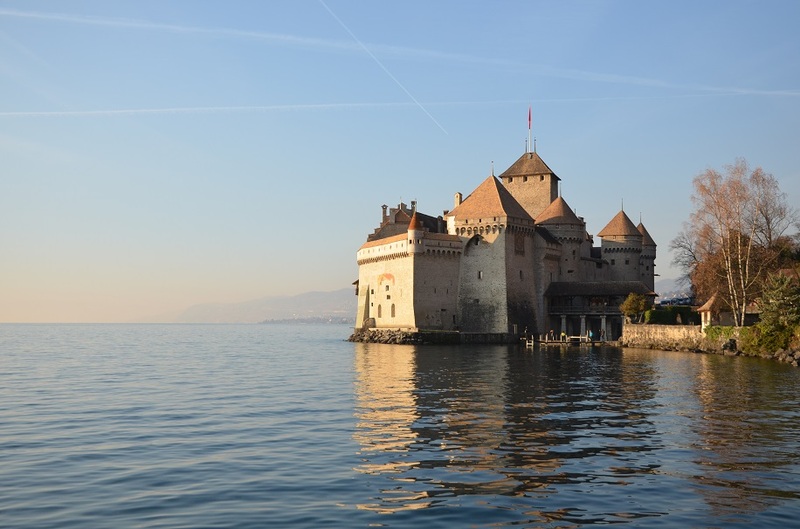 It was Lord Byron’s poem, Prisoner of Chillon, inspired by the six-year imprisonment of Genevan monk and political activist François Bonivard, that catapulted the château to fame back in the early 19th century. 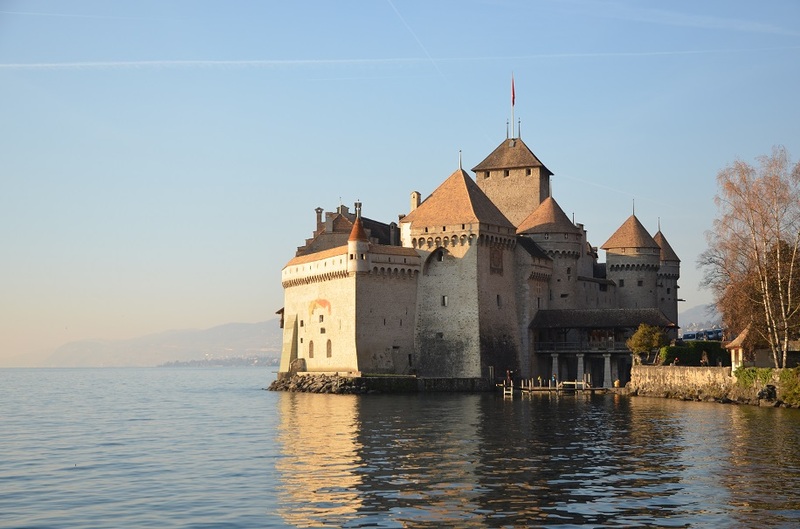 Today it ranks as the most-visited monument in Switzerland, and one of the country’s most recognizable landmarks. 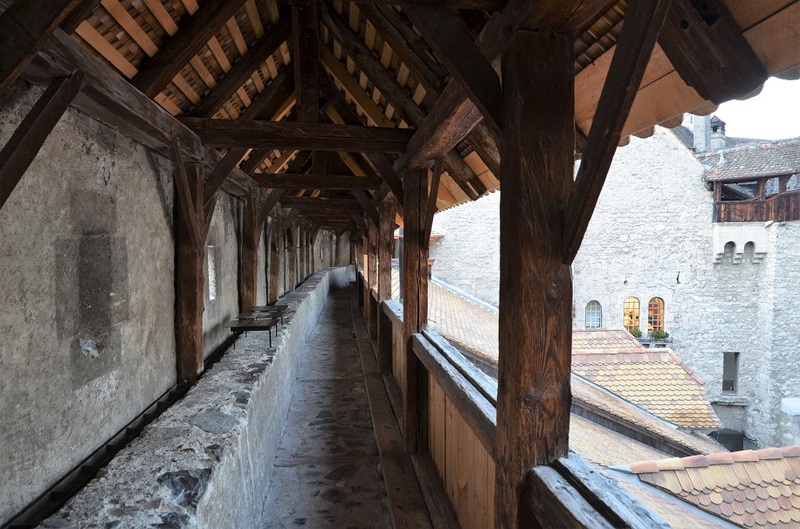 Don’t be fooled by appearances: the castle is far bigger than it looks from the outside, with three courtyards, a central keep you can climb, and a wealth of rooms and passageways to explore. Arriving an hour before it’s due to close, I have barely enough time to see it all. Angela herself is an Italian-born immigrant; she moved from Naples to Vevey at the age of nine, and started off without a word of French. Not long after the bus deposits us in the center of town, Angela points out the windows of the small apartment her family once shared, and then the college and dental school she attended. 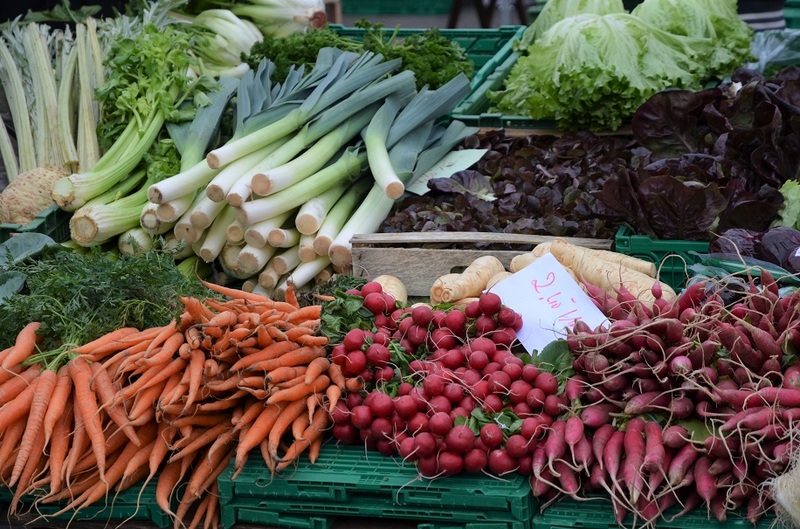 We make our way down to the farmers’ market on the lakefront square, and even though it’s winter, there’s plenty of fresh produce to ogle: leeks, mushrooms, carrots, leafy green vegetables, and Chioggia beets. Angela buys me a generous slice of homemade quiche from a friend’s daughter, part of a gang of schoolchildren raising funds for a trip to Berlin. Then, as we approach a stand piled high with local cheeses I could only wish to take home, she jokingly tells me, “this is the fruit of Switzerland.” But Angela is quick to explain that the country’s official abbreviation CH does not stand for “chocolate” or “cheese”; it’s derived from the Latin name for the Helvetic Confederation, Confoederatio Helvetica. Living in Indonesia, there’s a general expectation that anyone who travels ought to buy trinkets or edible gifts for friends and coworkers. 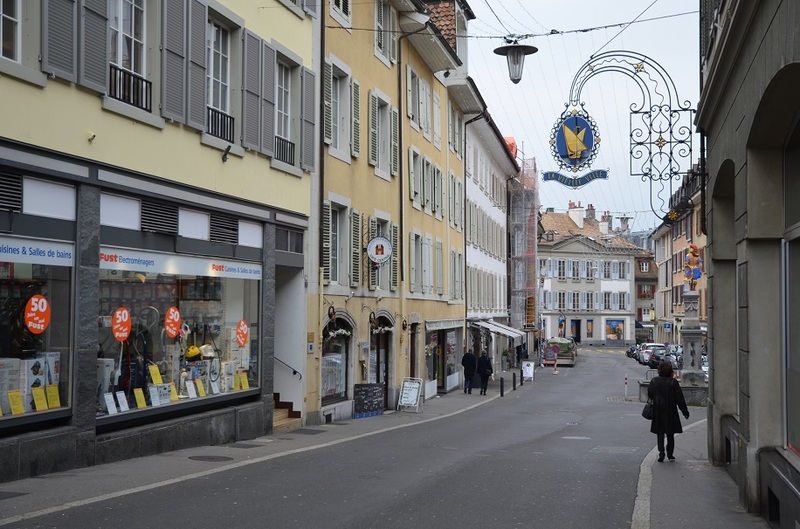 I’m in the right place – Vevey is the global headquarters of Nestlé, and we make a beeline for Denner, a discount supermarket chain, where great slabs of high-quality chocolate are a steal at just 65 Swiss centimes (approximately 66 US cents) apiece. Much to my amusement, this has turned into an impromptu shopping trip for Angela too. At a nearby boutique, she buys a silvery jacket whose collar comes lined with synthetic fur. The delight that spreads across her face is infectious. “I’ve never done this as a tour guide!” Angela squeals. Back in Montreux, after lunch at an Italian restaurant steps away from the Christmas market, I treat Angela to a cup of vin chaud blanc – mulled white wine. In turn, she brings me to pavilion serving up regional fare from outside Switzerland. The theme changes with each successive Christmas market; this time, the focus is on her native Naples, and she’s keen for me to sample a famous Neapolitan pastry: the rum-and-sugar-soaked babà. Sometimes the best kinds of food take on a humble appearance. This is the case with babà, which is shaped like a knobby mushroom. Biting into the glazed, moist exterior yields a dry, airy core – on the whole, it’s a perfect balance of sweet and alcoholic flavors. But I don’t discover that just yet. Sealing the precious babà in a small plastic box, we return to the hotel to pick up my bags and head straight to the train station. Thanks for dropping by, Jo! What a nice, crisp stop in December! I am (sort of) missing real winter, with warm drinks and hearty fare, cool lakes and Christmas markets. This was a nice way to get some of that … while sitting in my own warmer climate! Thanks, James! My pleasure, Lex! I think I am happy with living in the tropics – I just got back from a quick Christmas break in Hong Kong where it was dry, windy and temperatures went down to 14 degrees Celsius (57 Fahrenheit) at night. I’m not so keen on waking up with swollen, chapped lips or having to wear several layers outside! Love your photos. Thanks for sharing your travels again James. You’re welcome Arlene. Thanks too for reading and leaving me a comment! 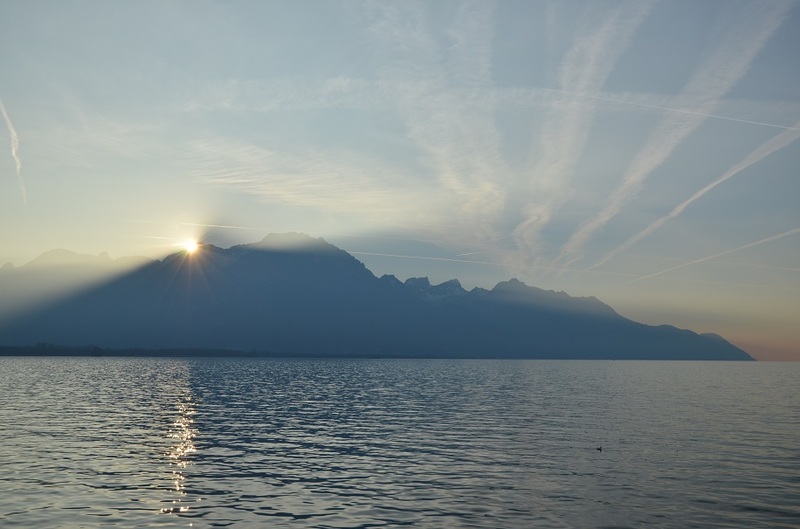 Despite the chilly temperature, sounds like your experience in Montreux and Vevey was a rather warm one, partially thanks to Angela. I like the anecdotes she told you about the contributions of immigrants in Switzerland — a real example of how embracing different peoples could enrich a country’s cultural scene. As for the food your tried, I’m really intrigued by babà. Dessert or pastry with rum … that will never go wrong! Bama, the babà was absolutely divine… I think you would have loved it! 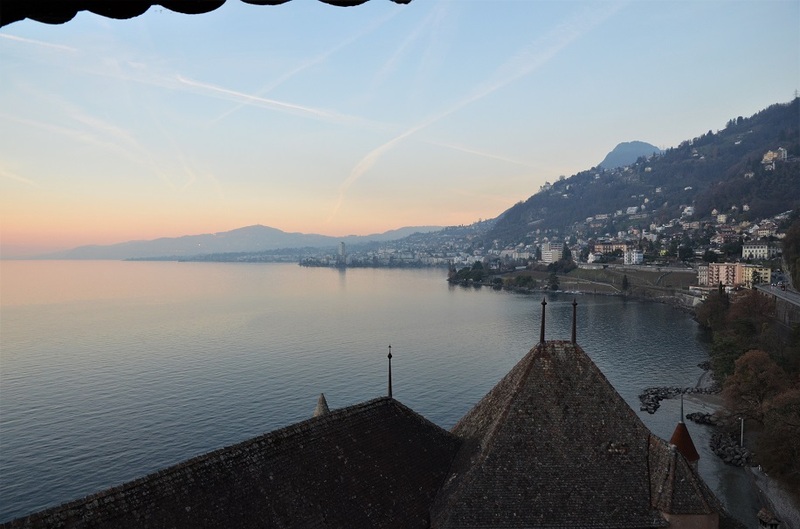 Montreux and Vevey had a certain charm at winter but I’d be interested in going back during the spring or summer months. Angela was a fabulous guide; while some tend to focus only on the good and repeat what is written in brochures and guidebooks, she told the truth! What a lovely report on this gorgeous place. Thank you, Debra – since it isn’t too far from Italy (a couple hours’ train or bus ride from Milan) I imagine you’ll get there in the near future! Lucky you! I have not been to this part of Switzerland but have travelled extensively in the German speaking parts (thankful I have friends there). It is a postcard-perfect country and I think their Chocolate and Cheese are both deserving of a capital letter CH! I agree – I must have gained a couple of kilos from all the fabulous cheese and chocolate I got to eat on that trip! My previous trip to Switzerland many years ago was largely restricted to the German-speaking areas as well… I found the French-speaking parts (Romandy) very charming and somewhat more relaxed. What a serene and pretty city! I haven’t watched Game of Thrones (no time I’m afraid!) but yes, the castle would be the perfect backdrop for a Medieval period drama! Warmest Christmas wishes to you and your family James, and for a wonderful, travel filled new year! Thanks so much, Madhu! I’ve just returned from a short but hectic Christmas break that was chock-full with feasts and family events. Wishing you good health and many memorable trips to come in 2018. I also hope that your brother-in-law is well on his way to recovery!